Rocky Lang has been involved in the motion picture and television business all his life. He has produced, written and directed motion pictures, documentaries, television shows, movies-of-the-week and mini-series. Mr. Lang recently executive produced Girl Fight for Lifetime Television and Racing For Time starring Charles Dutton, which received a Best Picture nomination for the Image Awards. Lang is currently developing The Patty Hearst Story at CBS and a two-hour untitled movie for Lifetime Television. Mr. Lang has just completed a book for Abrams Books, titled Letters From Hollywood that will be published in September of 2019. He is the author of eight other books, including How I Broke Into Hollywood, which was published by Judith Regan and Regan Books/Harper-Collins, Confessions of Emergency Room Doctors (Andrews McMeel), The Big Nasty (Cable), and Growing Up Hollywood, Differences Differences, Lara Takes Charge and If You Thought Your Divorce Was Bad, Wait Until You Read This Book (HLPI Publishing). Mr. Lang has been published in The Huffington Post and other papers and magazines and has appeared at Book Expo America, Publishers University, the Los Angeles Times Festival of Books, the San Francisco Writers Conference and other conventions across the country. 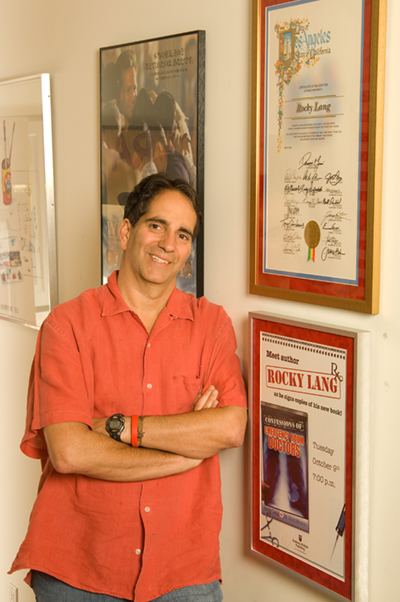 Growing up as the son of veteran producer and Universal Studios executive Jennings Lang, Rocky knew early on that he wanted to write/produce and direct. He has made five documentary films including the award-winning The Making of Tootsie and Spinners, which won Best Documentary at the Los Angles Film and Script Festival in 2013. Directing assignments have included the long-running hit show Remington Steele, as well as three features: Nervous Ticks (Columbia Tri-Star), Race For Glory (New Century Vista), and All’s Fair (Moviestore). Mr. Lang also produced White Squall for Disney/Hollywood Pictures, starring Jeff Bridges and directed by Ridley Scott and the Emmy Award-winning Titanic, a four-hour mini-series for CBS. During his career, Mr. Lang has had deals as a producer, and director with Warner Bros., Universal, New World, CBS, NBC, ABC, Twentieth Century Fox, Cinecom, MGM, Lifetime and United Artists. He is an award-winning screenwriter and has sold his material to numerous production companies. Over the years, Mr. Lang has worked with such luminaries as Dustin Hoffman, Jessica Lange, Jackie Gleason, Clint Eastwood, Sydney Pollack, Teri Garr, Sally Kellerman, George Segal, Peter Berg, Jeff Bridges, John Savage, and many more. Rocky Lang is also the author of a series of empowering books aimed at children with diabetes. His book Lara Takes Charge is in the hands of over 40,000 children, hospitals, and libraries. He also invented the Courage Badge for children with diabetes, purchased and distributed by Travelon and QVC, and the Joe Toucan Diabetes Doll. On May 29, 2008, the American Diabetes Association honored Mr. Lang as Father of the Year for his advocacy for children living with diabetes. Mr. Lang has served on the board of Foundation School Community, a progressive school in Los Angeles. He also sat on the Health Education Advisory Board at Children’s Hospital, Los Angeles, and served for five years on the Los Angeles Community Leadership Board and ADA National Youth Strategy Board for the American Diabetes Association. Tennis has been Lang’s passion and he is certified professional and a member of the United States Professional Tennis Association and is a member of The Directors Guild of America. Mr. Lang has two children, and five step children. He lives with his partner Andrea in Toluca Lake, CA.